Tomorrow at 11 Toby Cryns (the Mighty Mo guy) and I will be hosting a WordPress Geekout at Minnewebcon. We did this once before at the MIMA Summit and had a great time and the participants were very engaged. We'll share a few wordpressy things we've learned or stumbled upon and try to answer any and all questions. We encourage all in attendance to share their WordPress tips too. We won't involve ourselves in the WordPress vs. Drupal debate. So if you're at Minnewebcon, consider dropping by our session at 11! This entry was posted in Uncategorized and tagged minneapolis, minnesota, minnewebcon, wordpress on April 10, 2011 by Peter Fleck. Interesting article by Tim Post (@posttim) looking at the increasing population of mostly community college transfer students. The cost of tuition is a prime reason for starting at a two-year college. The article leaves me with several unanswered questions. Community college officials state their students do as well or better than students who do all four years at the U of MN but offer no evidence. The U of MN has survey evidence that transfer students are less satisfied with their experience than students who start as freshmen. A national survey (National Survey on Student Engagement) finds that transfer students take part in fewer campus activities. We need student ages to understand this better. What’s the median and average age of the transfer students? If they are older — say past 25 — it would make sense that they might feel a bit out of it and this would make them less satisfied. I would also guess that many of these students are holding down jobs and going to school part-time which does not help in integrating them in campus life. But really, I shouldn’t have to guess. The U of MN should do the research and share it. This would make a great longitudinal study (and probably should have been started a few years ago). This entry was posted in Uncategorized and tagged minnesota, schooling, uofmn on November 13, 2009 by Peter Fleck. 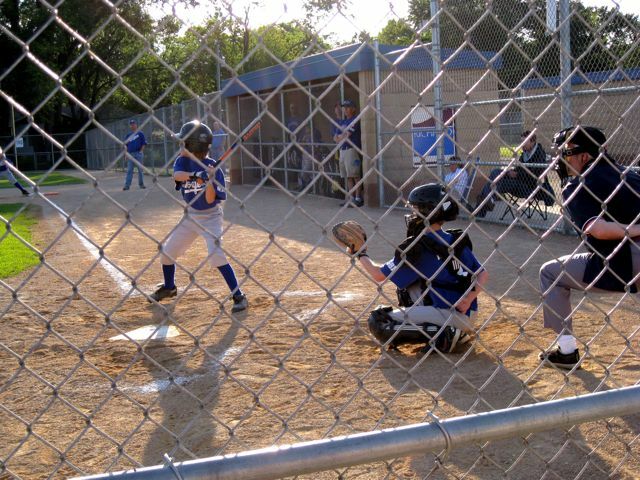 This was at the last game of the regular season for Robbie, the eldest grandson, and his team, the Richfield LA Dodgers. I really love watching these games. The season is almost over. Next week the Dodgers start the playoffs series. Oh, it was a great game and the Dodgers won 5-2. This entry was posted in Uncategorized and tagged baseball, minnesota, richfield, robbie on July 17, 2009 by Peter Fleck.